The deep freeze has arrived. 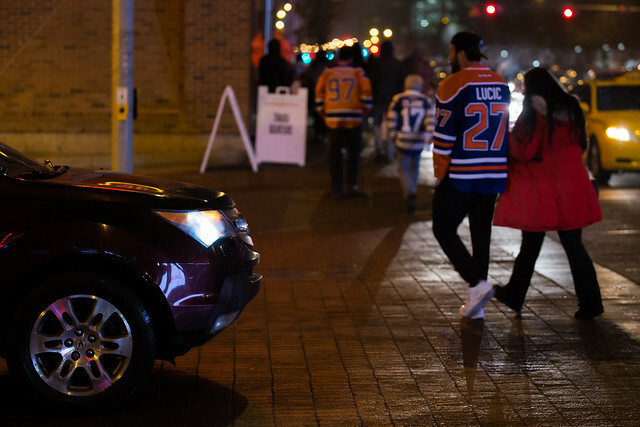 After hovering just below the freezing mark for a few weeks, temperatures in Edmonton are dropping fast and are expected to be as low as -30 on Friday. On top of that, we’ve got some fresh snow which means City crews are clearing & sanding roads. Better bundle up and give yourself more time this week! I don’t see how anyone could consider the proposed $150,000 donation to Central McDougall from the Katz Group anything other than a straight up bribe to get their desired parking lot. Council will discuss the proposed on December 12. The provincial and federal governments have announced another $500 million worth of transit projects for Alberta, but Edmonton isn’t on the list. St. Albert, Strathcona County, Leduc, and other municipalities in the Edmonton region will receive funding, however. A new initiative called Women & Money aims to “address a variety of financial topics” through “social media, videos, events and activities.” It’s a volunteer committee associated with City Council’s Women’s Initiative. From The Yards: Meet Mrs. Hut: The Teacher Who Teaches “Downtown”. Edmonton has a new recording studio called Velveteen Audio. It took over most of the former Powersound Recording space and officially opened in October just north of Oliver Square. FC Edmonton announced on Friday that they’ve re-signed head coach Colin Miller to a multi-year contract extension. This was his fourth year with the club. Council will be looking at the idea of safe injection sites this week. A new report says the sites could be opened within three existing agencies. Three Edmontonians along with the UNITE HERE Local 47 were recognized in the Premier’s Council on the Status of Persons with Disabilities Awards yesterday for International Day of Persons with Disabilities. According to the stats, the Oilers are a much better team this year. Definitely more entertaining to watch when they have a decent chance to win every night! See also: The Edmonton Oilers With and Without McDavid. The Edmonton Police have a new mobile app called eCruiser that will enable officers to create electronic collision reports on scene. Electronic reports will be available to motorists here. Note that winter bus schedule changes took effect today for 12 routes! 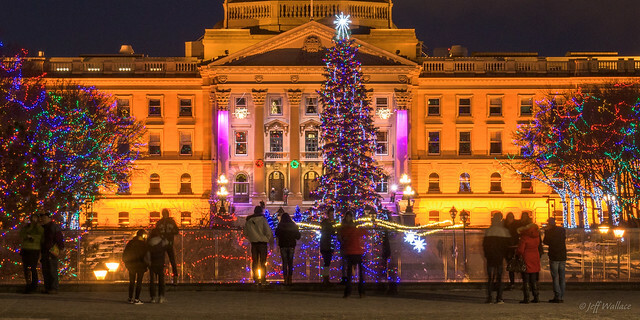 The lights at the Legislature look great! Check them out until December 23, and note there are some new ones in the Federal Building plaza as well! From YEG Date Night: 10 Edmonton Christmas Lights Displays That Will Make You Feel Like You’re in a Winter Wonderland. TEC Edmonton is hosting another edition of the TEC Venture Angels Forum on Wednesday over lunch. interVivos is celebrating its 10th birthday on Thursday at Central Social Hall! The party runs from 7-10pm. Also Thursday is The Yards Winter Salon taking place at CKUA in the Alberta Hotel. Royal Bison returns for another weekend at the Old Strathcona Performing Arts Centre, Friday through Sunday. Another season of Candy Cane Lane gets underway on Friday! Head over to the Valley Zoo on Friday for the kickoff of Zoominescence: Festival of Light. The event runs through December 18. The Carrot is hosting a Christmas Arts Bazaar on Friday and Saturday. The Oilers are on the road this week, but they’re back at Rogers Place on Sunday to host the Winnipeg Jets. Be sure to check out my Winter 2016/2017 Festival & Event Guide for even more holiday & winter related events! Get a jump on your New Years Eve planning with Linda’s great listing of events!